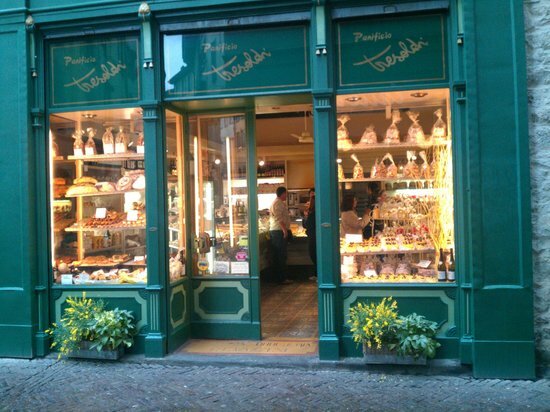 How is it that the Italian shop windows are amongst the most beautiful in the world? A less important aspect of the shopping experience in some countries, in Italy window design is an essential element of the merchandising package, just like the wrappings of a present or the bag that is used to carry away purchases, even for small shops. Most Italian shops and department store windows are a joy to behold, where everything looks irresistibly beautiful. All over the world people study window dressing or window design, also in Italy in every centimetre of the country, even with on line courses, but it can’t just be these courses that is the reason for their stunning displays that contribute to making shopping a very aesthetic experience. There must be something more. What is their secret? Where does their creativity come from? With one of the least creative educational systems in the western world, one wonders how Italians can ever become such creative individuals. Is it their having to live a life of navigating an obstacle course of barriers and bureaucracy the reason why they excel so much in all fields of the creative arts? But not only in the creative arts, in many other fields Italians excel, in science, engineering, music, literature, sports, cars, etc. Italian schools are not an inspiration for developing creativity in children, as almost all of the “learning” is done through rote memorization; most teachers (called “Professori”) give one-way lectures, followed by hours and hours of the Professors orally questioning students individually standing by their desks, while their classmates die of boredom waiting their turn to be questioned one day or the next. Notwithstanding this old-fashioned educational system, it still cultivates innovation, perhaps as students’ minds are forced to wander to survive and so find ways to evade the hours of interminable boredom during the school day. Undoubtedly, this system produces excellent theoreticians, recognized worldwide for their ability to discuss and elaborate details on practically any argument. In my opinion, it is those students who have difficulty with this system who later become the creative innovators, fashion designers, inventors, designers­, artists, thinkers, writers and dreamers. This leads to window dressing, where even a fruit and vegetable shop can become a feast for the eyes, enticing the passer-by to enter the shop and at least have a look around. The big department store windows, such as La Rinascente, show amazing theatricality and stage design that make them experiences “degno” of La Scala or of major art museums. The above photo on the right of a glove shop in Florence looks somewhat inspired by Zacchia da Vezzano’s painting of the Nativity in the 1500s on the left, but is designed in a more abstract format through the use of gloves. Beauty and harmony are present using gloves like colourful figures, with pillars and buildings in the background. Notice the similarities between the painting and the shop window? These are just gloves, but could there ever be a more beautiful display of gloves in a shop than these? This shop window innately reflects an essential element of the cultural heritage and abundance of artwork from past centuries present everywhere in Italian life and in the genetic makeup of all Italians; it’s no surprise they are so inspirational. However, Italians are not always serious; even black humour has its place in window dressing. The above photo shows “Saldi mai visti” (Sales as never seen before). How can anyone even think of using Andrea Bocelli, the blind opera tenor, in this way? It could also be offensive to the singer; however, it is quite effective in catching the attention of the public and cannot go unnoticed. Window dressing is an added expense, especially if one considers that in Italy shopkeepers pay taxes even on awnings to protect shop windows from the strong Italian sun, the so-called shade tax, but also for permission to put plants or flowers outside the shop. The shade tax is charged per square meter, based on how much shade the awning covers over public land. It sounds a bit like a joke, but the country must somehow further maintain their high taxes and costs of bureaucracy. However, it remains a mystery; one wonders if it is their educational system, DNA, rich cultural heritage in every angle of the country, wine and food, classical and contemporary music, Italian language and literature, countryside and seascapes, iodine from the Mediterranean Sea or are the Italians just plain gifted? What is it exactly? I think that many people would like to know their secret, but perhaps we will never know what it is exactly, and perhaps they don’t even know either, but it’s definitely present and is a country worth visiting to see some of their spectacular shop windows. Pendert Weekes is the Managing Editor UK, a writer and career art professional. I think it’s how the Italians use color. The work of Italian artists is also pretty amazing – contemporary art, even without considering the great masterpieces of the past. The art of Japanese gift wrapping still done in many shops in Japan today is a very beautiful practice; some say it is a form of origami. It’s a much nicer way to take away one’s shopping, than just thrown into a plastic bag – it’s a whole experience. The Italian shop windows are very beautiful, but the Italian shopping experience can be quite daunting. People do not respect the queue and regularly cut in front of others, unless they have a ticket machine that gives out numbers, which help avoid this situation. 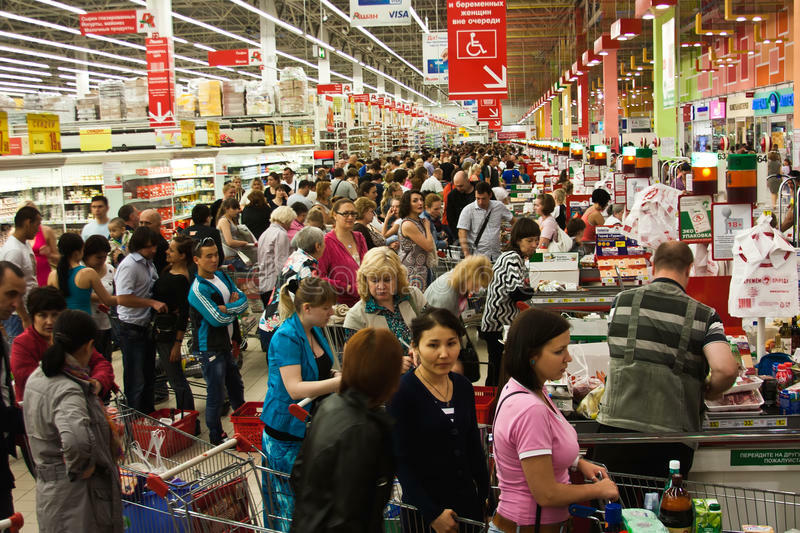 It can be quite unpleasant at the supermarket when people push their shopping trolley into the side of the queue and just pretend not to see all the people behind them. Most of the time they get away with it, but it leaves the others feeling a bit angry. What can be more beautiful than a bread store in Italy (and the smell of freshly baked bread coming out of it)? Some of the French shop windows surpass the beauty and finesse of the ones of our Italian neighbors, though no doubt their shop windows are also very nice. 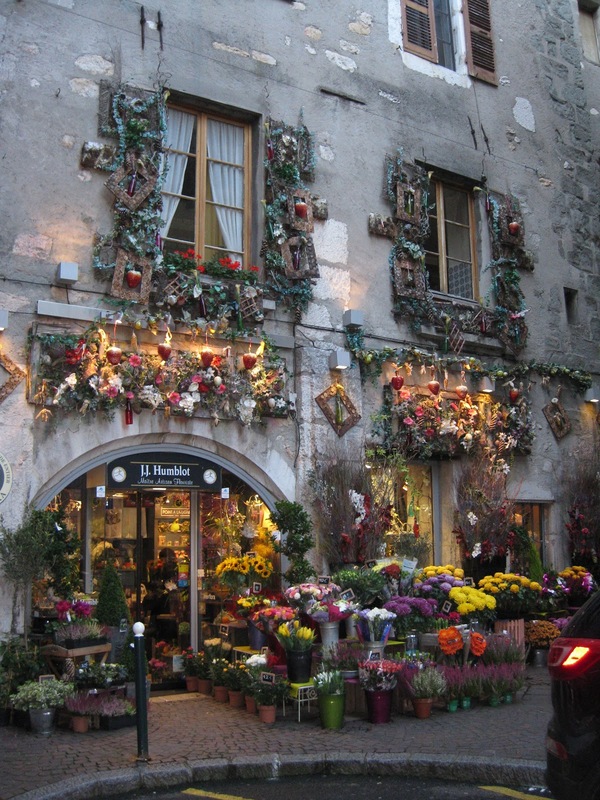 This flower shop below in Annecy, France resembles a French impressionist painting with the building itself and the display of the flowers.